Polite society has its rules for marriage. But for Ella Quinn's eligible bachelors, their brides will show them that rules are for the weak of heart. . .
Phoebe Stanhope is not a typical Lady. As feisty as she is quick witted, no one can catch her, especially when she is driving her dashing phaeton with its perfectly matched horses. And unlike her peers, experience has guarded her against a growing list of would-be suitors. But when she encounters Marcus Finley, what she fears most burns deep within his blue-eyed gaze. . .
For Lord Marcus, the spark of recognition is but a moment in the love he has held these many years. 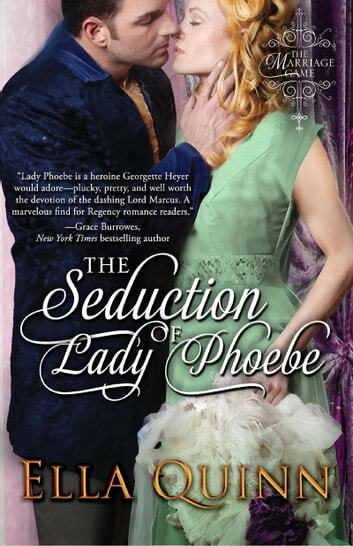 Now that he's returned to England, all the happiness he desires rests on Lady Phoebe never finding out that he was the one who turned her heart so cold and distant. He must work fast to gain the advantage—to convince her what she wants is exactly what she denies—but in order to seduce her into his arms, he must be willing to give up more than he can control. . . Brilliant story with lots of twists and turns. Just goes to show how difficult it is to learn to trust someone after there has been a betrayal of that trust - but that it is possible if the people make an effort to change that way they were. Very easy to read with strong family ties and their help, some graphic loving and the storyline is strong. I'm happy to recommend is book. Couldn't stop reading! Wonderful love story, with suspense thrown in as well!